6. Reading plan ( 85cm high from floor surface). 7. For two-side seats 165 Lux. 8. For rear bench seats 80 Lux. 9. Aisles floor surface 110 Lux. 10. Dust. noise and water protect. 1. Dimension: 1500mm x110 x 39.7 mm. 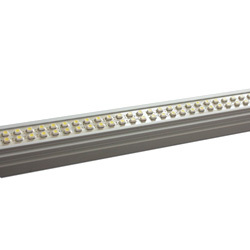 2. light source: power LED 1w x 40 pcs. 3. Power: 40 - 45W. 4. Housing: sluminum. 5. Base type: defined by customer. 6. Housing color: silver. 7. Weight: < 4Kg. 8. Power pequirement: 24 VDC. 9. Power consumption: maximum 50W. 10. Operating temperature: 20 ~ 40 degree C. 11. Storage temperature: 40 ~ 80 degree C. 12. Humidity: 0 ~ 90% non condensed. 13. Body temperature: 50 degree C @ ambient temperature 25 degree C. 14. LED life: > 50000hrs.